Olga Masters (1919-1986) was a journalist, novelist and short story writer who won the National Book Award in 1983 for her short story collection The Home Girls (1982). Loving Daughters (1984) was her first novel. It tells the story of two sisters, Una and Enid, in competition for the one eligible male in their small farming township south of Sydney after The Great War. Jack came upon her once sitting on the narrow little verandah rubbing her feet gently into the earth. He had pulled his horse up, hidden by a thicket of eucalyptus, and watched the girl get up and clear a window of cobwebs to look in. Not much to see but four rooms and a fireplace that would take a stove and had a chimney still in working order. Nellie had made a home of it! He was beginning to think grudgingly that the girl might too, when she moved to the end of the verandah, standing so that her big stomach became a silhouette. Jack wheeled his horse then and cantered away too angry to care whether she had seen or not. Those stomachs on women offended him! The girl had trapped Henry, there was no doubt of that. He was glad he did not have to look at her that evening at tea, for she had gone to bed with stomach cramps, he overheard Enid say, and Henry went off to play cards at the Hickeys. George blamed the girl too, but had envied Henry, mostly at night, George’s room being next to theirs. He heard, or imagined he heard, the thud of Henry’s body leaving hers, and the stirring of bed springs as he gathered the bedclothes around him for sleep. A woman with you in bed! Violet next to him! He needed to rub his face into the pillow to rub her away. The girl spoke little in the daytime in the Herberts’ company, and he listened hard at night for her voice, thin and wispy like her hair. She had a short cut, one of the few in Wyndham, convincing Jack that here was another reason why she got herself in trouble. Girls with long hair wouldn’t be free with their favours, Jack thought, with his mind on Enid. 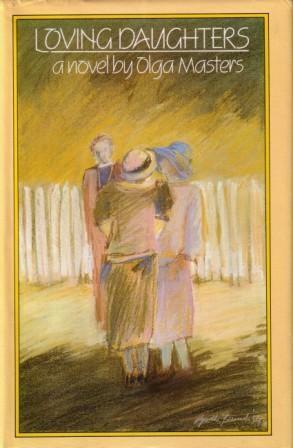 Olga Masters, Loving Daughters, University of Queensland Press, 1984 First Edition. You can also check out my review of Olga Masters Amy’s Children. Oh, you’re reading it! I loved Master’s characterisation in this book. There’s something very Jane Austen about it – the social satirical aspects – yet different too. She’s so knowing. And so economical: Jack’s view of women and his plans for his daughter Enid encapsulated by that sly remark about short hair. Yes, economical is a good word for it.